Wash and peel your sweet potatoes and beetroots. Cut any wide edges from the vegetable if they are too large to fit into the Spiralizer. Spiralize the sweet potato and then the beetroot. 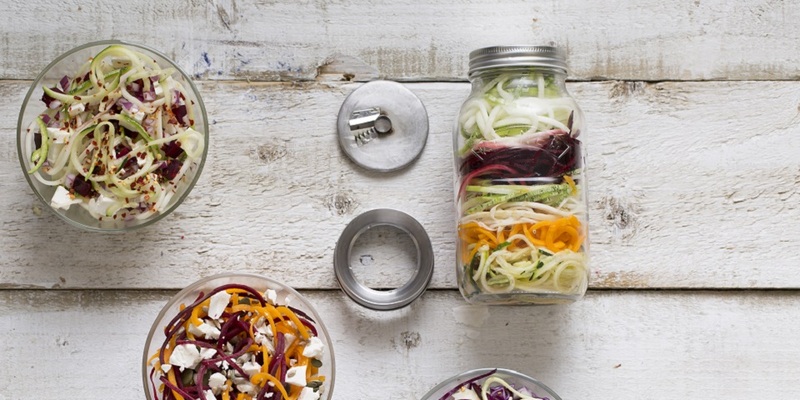 Use the jar to make the salad or decant into a serving dish. Layer your salad and then sprinkle the pumpkin seeds and feta cheese. Toast the pine kernels in a dry pan over a low heat until slightly coloured; sprinkle liberally over your salad.